Les travaux d'Aatifi sont caractérisés par la particularité de la forme, ses lignes et son contexte mystérieux. Déjà en 1989, au début de ses études en peinture à la « Faculty of Fine Arts » de l'Université de Kaboul en Afghanistan, Aatifi était reconnu comme artiste exceptionnel. Il obtint le premier prix du Ministère de la culture pour son travail en calligraphie et en composition. Le même prix lui fut accordé l'année suivante pour son approche inhabituelle et originale de la calligraphie. Aatifi a débuté très tôt en calligraphie. Dès l’âge de six ans, Aatifi fut pris en charge par un maître calligraphe où il fit un apprentissage. Au fil des ans, Aatifi a réinterprété l’écriture orientale, riche en traditions, en un langage complètement nouveau, réduit à son esthétisme le plus pur. L'artiste qui vit et travaille aujourd'hui comme peintre et artiste en art graphique à Bielefeld, en Allemagne, est essentiellement orienté vers l'art scriptural. Son style est un amalgame entre l’art moderne et la calligraphie orientale. Déjà, à l’époque où il vivait à Kabul, son art ne correspondait plus à la définition classique de la calligraphie orientale. Entre-temps, ses dessins fragmentés sont réduits à un pur tracé de ligne. Dans ses compositions il s'agit exclusivement de créer par la force, la dynamique, la profondeur et l’espace, un jeu d'équilibre entre les formes et l’esthétisme qui en résulte a sa. Ses travaux prennent ainsi un sens universel et compréhensible dans une dimension hors temps; c’est ce qui lui rend sa modernité. Aatifi réussit à convaincre par la force de ses images et par son expression artitistique. Il démontre que les images peuvent devenir médium là ou le langage est à court de mots, l'écrit dégagé de son contexte devient ainsi un paysage imaginaire. Ses estampes sont accentuées par la grande complexité de la technique de l’aquatinte-réservage. Cette dernière, en se juxtaposant, s’adapte à la forme d’expression pittoresque d’Aatifi. Avec des plaques de cuivre, souvent de grande taille, Aatifi réalise sur papier des estampes filigranées, puissantes, de couleurs intenses et aux contrastes très expressifs. create a complex space on the canvas supported by their diverse colours and materials. Every possibility to interpret his mother tongue has thus vanished allowing the outside observer to find an independent access to the depicted figures. to the next. Canvas and paper are turned into membranes for appropriated ideas, for the genuine and for the combined. His oeuvre bridges the divide between things which are all too unfamiliar at first sight and seemingly unapproachable. 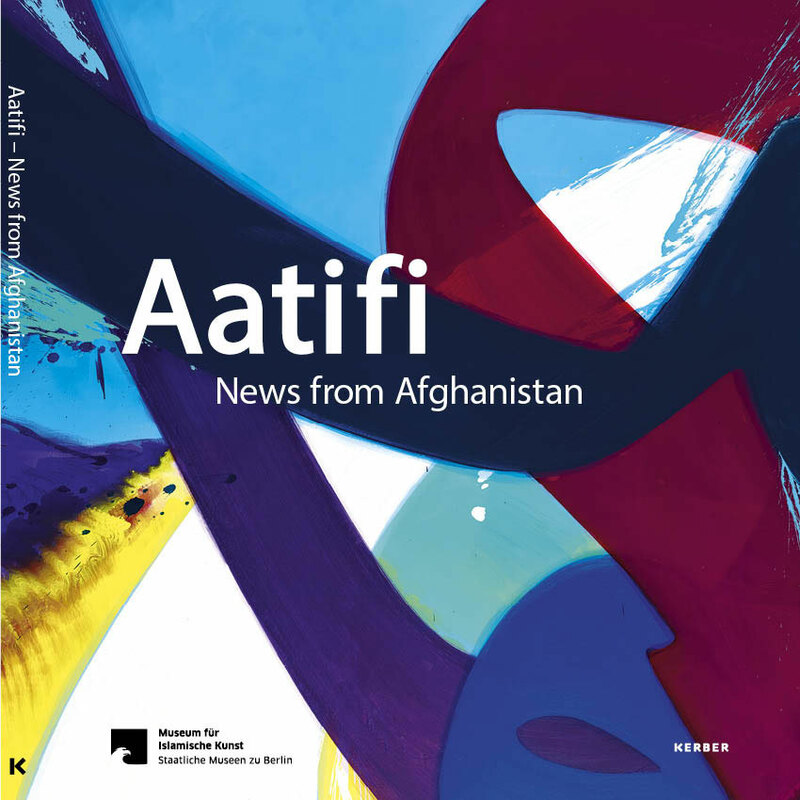 Aatifi: Afghanistan actually does play a role on the art market – unfortunately with stolen art. But that doesn’t fall within the scope of my responsibilities. I make my contribution to contemporary art, though. Your script art is based on traditional calligraphy. What role do characters play in your painting and graphic art? For me, characters are a part of totally abstract art between people: art for humanity. As for the question as to what role they play for me, and how I came to art, one could also ask a fish how it came to the water. When you were six, your parents sent you to a master calligrapher, in parallel to your schooling. I came into contact with advanced pupils, and got into discussions on calligraphy. I advocated the opposite of what they believed in. I was for a less traditional and technical way of learning. So you questioned the rules from the start? We artists are constantly questioning the rules. Actually, there are no rules. Rules are created by people. And we are also people. That means that we can change that. What rules existed in my field – art – was something that I wanted to decide for myself. At that time, had you already begun altering letters? That sounds like a detached relationship to tradition. in Kandahar sewed by hand consisted of geometrical shapes, colours, colour compositions. All of the rugs were abstract, and the sum total of patterns around me were abstract – or said something else to me than what people normally interpreted them as meaning. For me, this abstraction was much more important and beautiful and interesting than this tradition. As a boy, I never worried about what was good or bad for me. I simply took the freedom to do what I wanted. Kandahar was once a cultural and political centre, and the capital of Afghanistan. Did you have access to European art there? Did you deal with Western artists? 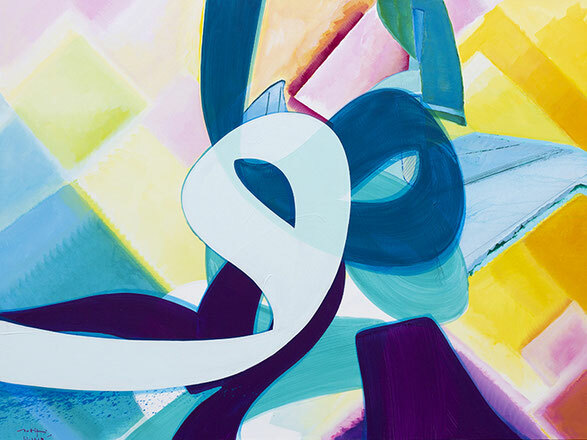 its traditional calligraphy, there would be no freedom for my abstract calligraphy. Kabul was pretty free, and had an art academy. That’s why I moved there at seventeen. You came to Germany in 1995, and to the former East Germany several years after Reunification. How were things then? By chance, I landed in Dresden. After three weeks I met a musician and artist from Australia and we became friends. Shortly afterwards I went along with him to a pub and there was Professor Siegfried Klotz with other professors from the HfBK Dresden, and we met him. Klotz saw my photos and said, “I invite you to my studio, it’s open to you any day. If you want to come there I’ll take you on, you can skip the entrance examination, etc., I’m behind you now.” It was really great. Yes – I had photos of paintings, of my earlier work. I had nothing but a backpack I always had with me. Everything was in my backpack: pens, drawing pad and photos. That way I could ‘prove’ myself; it was my ID. You spent a year as a guest student at the Kunstakademie Dresden under Professor Klotz. What contact did you have with your fellow students? Apart from Professor Klotz, I had no contact with other people and no one had any contact with me. I was in their midst, and almost like a penguin in the desert. This special status gave me complete freedom. Going back to the development of your script art: how did – and does – your type of calligraphy differ from that of the classic calligraphers? They spent a lot of time drawing traditional, academic shapes. I freed the shapes roughly from the text, but not yet completely from the content – only from the general way of portraying them. What sort of content did you use? What did you get from the HfBK, from the German school? First and foremost, I got the freedom to come and go there, and at least there was no civil war in the background. The freedom to change calligraphy is something you took for yourself back in Afghanistan. But the freedom to fragment it and radically reduce it – is that something you only began doing in Germany? also pared back my art. I took calligraphy far, far away to another territory. I returned the originality to these aesthetic forms, without content. This aesthetic itself must be the topic – and this compositional, abstract distribution which touches people in a completely challenging manner, and which they can interpret in their own way. The origin is in there, but the handwriting is mine, and that’s great. to come into contact with graphic art. That was my discovery in Dresden: graphic art with its very mysterious, uncontrolled techniques. I developed my plate art there – I still do that today. in Afghanistan. I became familiar with a great many graphic art techniques in Dresden, including aquatint lift-ground, a technique which is very uncontrolled and unpredictable. Even as a child I loved everything that couldn’t be dominated, and where a risk is involved – and I still do; it’s the best. Nowadays graphic art is every bit as important in my work as painting. to some extent? After all, in traditional graphic art it tends to be the classic colours of black and dark blue that are used. With me, that probably has more to do with the black ink that I worked with in Afghanistan. Black ink is also very reduced to its own graphic forms; it’s neutral. I worked in black and white, black on white paper, with the forms as I saw them – and graphic art corresponded exactly to this quality. That’s why I picked it up at once, and with such pleasure. Another thing about the German school and Germans: I think Germans and Afghans are very alike – as people, in their mentality and taste. They are so similar to each other; they move very straight, have patience and their own style. They are good, but they mustn’t be offended. Causing offence is not on. I’ve always kept on working. At present I live in Bielefeld, have my big studio here, in a nice town – not too small and not too big. Here, I can work in peace and I’ve still got a lot of plans. In principle, though, I can emigrate to Spain tomorrow with a backpack and begin there anew. A geographical location doesn’t mean that much. Since 2010 you’ve been travelling again regularly to Afghanistan, to Kabul. For over fifteen years, you were unable to do this. Did you miss your old homeland? a geographical location that’s in a constant natural flux. Hence, the best homeland is the one you carry in yourself. Let’s talk about something that has to do equally with homeland, politics and art: lapis lazuli. very, very interesting on account of that colour, and I was always angry that there was this war because of these resources, with many people suffering and losing their lives because of this. Such a beautiful colour, such a beautiful nature, and so many people killed because of it. Hence, lapis lazuli remains a symbol for me to this day. Even Michelangelo held lapis lazuli from Afghanistan in high regard, and made use of it. Aatifi [laughing]: Afghan lapis lazuli is a very special stone. It has a very compressed colour. No matter how much it’s broken down, it does not become transparent. That means that it’s a very dense colour whose intensity hasn’t changed for thousands of years, which always stays the same. That’s lapis lazuli from Afghanistan. In art history it is known that Michelangelo had a yearning for the stone, and kept on sending pupils for it while he was painting the Sistine Chapel. “Bring me the blue paint from lapis lazuli,” he’d say. They’d bring it, and he’d send them away again with the words, “No, not this one – only lapis lazuli from Afghanistan.” [laughs again] This colour keeps for a long time and remains very vivid. It doesn’t lose its luminosity, even when exposed to daylight. This colour is often found in your pictures too. I like blue in general, in all its shades. I like blue like the universe. When I look at it, I see an infinite freedom and a great calm in it. Do you yourself paint a lot with pigments? standardised colours and paintbrushes aren’t my thing. Moreover, a good calligrapher must create his own tools. There are only special people for producing the ink who have this recipe, although some calligraphers also have it. How the ink is further influenced in the studio is something that is each individual artist’s secret. If we reveal it, I’ll have another secret the day after tomorrow. How do you go about painting? When I lay stretcher frames on the floor and stretch the canvas over them, I can already see scenery, an incredible collision of natural elements, almost like a volcano or a universe. The universe fascinates me because it is nature in the raw, because all its elements are in motion. In the whole world, in our lives, in the universe, nothing stands still; everything is in motion. How does it feel to stand in front of a blank canvas? to this strife-torn global society, in which people no longer have any fixed support. Are there any other ways of expressing that besides painting? for me. At this time no other power places itself in between; I just go to the canvas and touch it. ...perfect, because I paint it that way. Perfect or imperfect, that doesn’t exist in painting, it’s the painter’s style. When Cézanne broke down a landscape with just a few strokes, in another diagonal or horizontal line, that doesn’t mean that it is perfect or otherwise. Perfect doesn’t exist. That is his breakdown and that is my breakdown. That is my way. into painting, incorporated it into painting, associated it with painting – not just with painting, but with depth and space, as well as with dynamics. It’s alive, it’s meant to be alive. Each stroke is meant to be incredibly powerful. And I’m interested in the mysteriousness that constitutes a shape. You spoke of Cézanne. Are there other artists you hold in esteem? What constitutes a good artist? Concentrating only on one’s own thing and not letting oneself be influenced by the outside and by the market. Are there people who play a role in your art, in your artistic life? All people! All the people surrounding me – good and bad – play a role for me. a lot of sunshine and vineyards and a great deal of light, especially the evening light or the early morning light, with this blue, blue and blue. I’m simply a fan of blue. That’s one reason why I visit Provence on an almost regular basis. What general conditions are vitally important for you as an artist? What would ideal conditions be? The ideal may yet come, but the worst is civil war, and that’s behind me. What sort of plans do you have for the future? What does your solo exhibition ‘News from Afghanistan’ in the world famous Pergamon Museum mean for you? 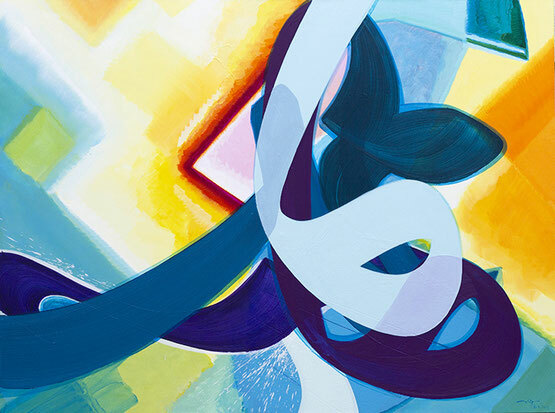 It’s a great opportunity to show my work in a centre in Germany where the whole of Islamic art history is gathered, and to relate it to my current position. The formats of my paintings are very large and unusual. I’m happy about it! In the exhibition, the modern age meets ancient cultural assets. At the very beginning, in the area of the stairway to the Museum für Islamische Kunst, large paintings of yours hang in close proximity to historic Sumerian-inscribed stelae. That’s a very nice story. And in the Mshatta hall, two large-format paintings in magenta are in dialogue with a façade of a caliph’s palace from the 8th century. The Mshatta hall shows history, architecture, handicrafts – it’s magnificent. For me, it’s interesting that this is an enormous hall, with a skylight – and they’ve juxtaposed my magenta works with it. How does the public react to your paintings? With strong rejection as well as with strong praise. Strong rejection makes me as little disappointed as strong praise makes me proud. But in the middle there’s a point, and that’s what I pursue. You’re a very good draughtsman, and you’ve always drawn, from childhood onwards. Does the figurative, the representational, play a role in your current work? 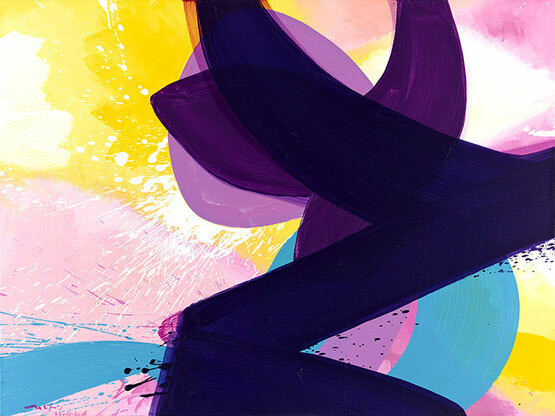 When I draw or paint shapes – the abstract characters – my environment, nature and people are naturally present for me; they’re always on my mind. I always draw. All of my drawings flow into the abstract. Drawing is simply an appetiser for a delicious meal. What projects would you still like to accomplish, what ideas have not yet come to fruition? So a normal human lifespan isn’t long enough... Lastly, can you once again sum up in two sentences what painting means for you? Des images qui impressionnent par la force de leurs compositions, leurs profondeurs, leurs colorations puissantes et lumineuses ainsi que par des formes mystiques soulevées par des effets de lumière inattendus. Aatifi personnifie la magnificence de la couleur, la diversité de forme et l'abondance de lumière de l'Orient et transpose cette vision sur toile et papier. Sa création artistique est fortement inspirée par ses racines orientales millénaires qu’il relie, dans ses travaux, à l'art européen et ses techniques modernes. Aatifi et ses œuvres sont en soi, une forme d’amalgame culturel. Il est né et a acquisune formation de calligraphes à Kandahar, ville qui fut considérée longtemps comme un noyau socio-polique et culturel de l'Afghanistan. Très doué pour le dessin, il à fait des études en peinture à Kaboul en Afghanistan puis à Dresde, en Allemagne, ou il découvre et applique à les techniques européennes d’art graphique. Son travail lui valut, en Allemagne, maintes distinctions ainsi que des bourses. Parallèlement à l'école, Aatifi débute dès l’âge de six ans, un apprentissage chez un maître - calligraphe. Plus tard, autour de la vingtaine, il part pour Kaboul, capitale de l’Afganistan.Il s’y installe et s’implique dans le milieu artistique où il sera reconnu avant même son admission et le début de ses études en peinture à la Faculty of Fine Arts de l'université de Kaboul en 1989. En Afghanistan, Aatifi obtient deux prix importants pour le caractère inhabituel de son œuvre. Il devient en 1989, le récipiendaire du premier prix du Ministère de la culture afghan. En 1991, soit deux ans plus tard, il remporte le premier prix du Cercle d'artistes afghan, le « Hakim Naser Khesraw Balkh »". Ces deux grandes distinctions ont consacré son individualisme en calligraphie et la force de sa composition. Il commence déjà à cette époque à développer un intérêt particulier pour l'esthétique « pure » de la forme. Aatifit vit et travaille en Allemagne depuis 1995 où il perfectionne et développe les différentes facettes de son engagement artistique. Il est d’ailleurs accueilli à l’Ecole supérieure d’Arts Plastiques de Dresde où il travaille en tant qu’artiste invité en collaboration avec le professeur d’art Siegfried Klotz et par le cercle d'artistes Saxon. Il se fait reconnaitre dans le milieu artistique de Dresde et de Radebeuler. Il s'implique de plus en plus dans l'art européen. Il entre pour la première fois en contact avec l’art graphiques et ses différentes techniques. Il fonde, avec trois autres artistes, l’atelier « Oberlicht » qui se transforme en plateforme expérimentale au niveau de la peinture, le dessin libre et différentes techniques de lithographie. Depuis 1999 Aatifi est établi à Bielefeld en Allemagne. Son art est devenu entretemps principalement abstraits mais Aatifi continue tout de même à expérimenter et développer sa peinture, le dessin et l’art graphique. il maîtrise l’art figuratif. Actuellement, ses créations sur toiles ou papier représentent une fragmentation de la calligraphie. Cette dernière est soumise à son esthétique de composition artistique. Les signes orientaux sont destitués totalement de leurs sens et disposition traditionnels. Par la fragmentation et le détournement de leur contexte, ces signes prennent une toute autre dimension. Aatifi emploie consciemment des combinaisons de couleurs inhabituelles et des éléments de jeu hasardeux afin de concrétiser la rupture de forme. Pour ses travaux sur toiles ainsi que pour ses gravures et estampes, Aatifi préfère la forme d'expression pittoresque de l'aquatinte-réservage. Ses compositions reflètent une esthétique mystérieuse et exercent une magie puissante et poétique. Aatifi a réalisé quelque chose d’unique. Il a réussi a créer un amalgame entre l’écriture orientale ornementale dans sa forme non figurative et complètement autonome et l'art occidental moderne. Ses œuvres sont d’un caractère à la fois individuel, distinct et tout à fait inédit. La qualité de son art le distingue par le lien qu’il crée entre différentes époques et différents continents. Sur une échelle de valeur anthropologique et culturelle, composant avec l’ici et maintenant, Aatifi se réfère aux origines de l’écriture d’il y a peut-être 30.000 ans. Cela rend ses images, dans un contexte de globalisation/mondialisation, compréhensible et cela en dehors du cadre et des tendances de l'art contemporain. Ce qui en fait un artiste d’une très grande actualité.